Local Government Super, an industry superannuation fund covering local government workers in NSW, has announced increased negative screening for high carbon assets such as coal mining and coal power generators, specifically citing the impact of climate change for this decision. The additional negative screening will exclude companies from its portfolio with a material exposure to ‘high carbon sensitive’ activities such as coal and tar sands mining, as well as coal-fired electricity generators. The threshold for this screening has been set at a minimum of one third of company revenue. The Super fund has used negative screening since 2000 regularly reviewing this policy and it's application. The policy has limited investment with companies involved with tobacco, gambling, armaments and old growth forests, as well as excluding companies with poor management of environment, social and governance (ESG) risks. Local Government Super has about $8 billion in investments. The policy will mean about $25 million will be divested from various mining and energy companies, including $15 million in shares of AGL Energy and Whitehaven Coal. The statement may not please all environmentalists with a decision also to remove a nuclear energy screen thus allowing investment in nuclear energy companies. Peter Lambert, LGS Chief Executive Officer, said in a statement that this was an economic decision driven by the outlook by governments to transition to a lower carbon economy in response to the increasing threat of climate change. “Climate change is an unarguable scientific reality and one which poses a very real investment risk. Governments around the world have begun to act on climate change, which is having a negative impact on the future outlook for the coal industry. This focus will likely continue as coal companies become increasingly difficult to be relied on as a low-cost energy source,” Mr Lambert said. In December 2013 Local Government Super received the highest ranking in green investment, with it being ranked second globally for its sustainable investment practices by the Asset Owners Disclosure Project. More recently, on 1st October 2014 the fund was awarded a five-star rating for outstanding value from CANSTAR for the second time running. Only 11 Australian super funds received this rating. This follows HESTA industry super fund decision to restrict thermal coal investment due to the growing risk of 'unburnable carbon' in September, and Australian National University announcing a decision to divest from 7 fossil fuel and mining companies including major CSG company Santos. In early September economist and former leader of the Liberal Party John Hewson warned that superannuation is destroying the planet with an estimated 55 per cent of pension contributions invested in high-risk, high-carbon assets. 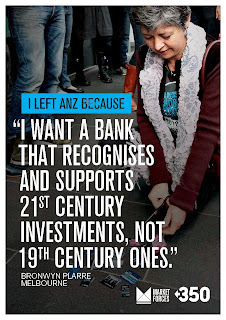 There is already a consumer campaign to divest from the big 4 banks - The Commonwealth, ANZ, National Australia Bank, and Westpac - due to their substantial investments in coal and CSG companies and funding mining export infrastructure in Queensland which will contribute to degradation and destruction of the Great Barrier Reef. It is no secret that coal barons and climate change are driving Great Barrier Reef destruction. But investment in the Galilee and Bowen basin coal mines also risks stranded assets. Latest news from China fromh a survey of thermal coal used in six major coastal electric utilities shows that consumption declined by 23 per cent during the August-September period. A divestment day is rapidly approaching on October 18.